Excellent resistance against solvents. Best choice for the pressurized solvent transport. Excellent resistance against solvents. Best for the pressurized solvent transport. The air hose and the pressurized solvent transport hose are paired. 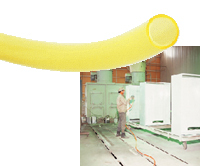 It is easy to use because the air hose and the pressurized solvent transport hose are paired. * Use the following table to select a hose for a particular working fluid. After immersing a test sheet in a solvent at RT(20 ± 2°C) for 336 hours (2 weeks), measure the weight change of the test sheet. * The results may vary depending on the test conditions. For details, inquire to us.